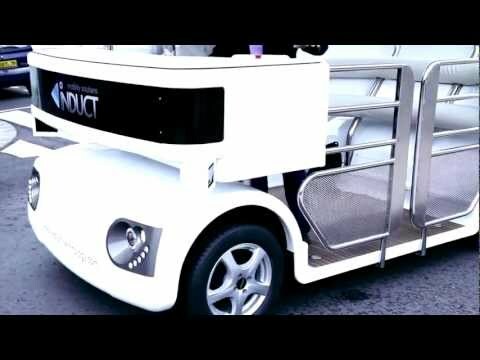 The Navia is a fully autonomous eight-seat shuttle. The Navia is an eight-seat shuttle with a profile that can’t quite shake its golf cart aesthetic, which doesn’t prevent it from being a fully-loaded bundle of awesome. As well as being fully autonomous, the Navia features touchscreen navigation and an electric motor. It even parks itself atop its charger when not out ferrying folks around town. A system of lasers and sensors detects anything that might be in the Navia’s way and allows the vehicle to properly avoid obstacles in real time. There are a few hefty limitations to what the Navia can do, despite its high-tech innards. Range, of course, is a factor. A public transport which might be called upon to run at any time is even more tethered to the area surrounding its charger than your average EV. There’s also the question of horsepower. The current generation of Navia tops out at 12.5 MPH. Road trips are undeniably out of the question. Instead, the company behind the Navia is calling it a “last mile” vehicle. Their aim is to provide a transport that can navigate sprawling university campuses, airports, theme parks, and hospital complexes. And that’s just the sort of venue the Navia will be tooling around very soon in Singapore. Having been successfully tested at venues around the world, including Austin, Texas as recently as this June, Singapore’s Nanyang Technological University will be the vehicle’s very first real-world environment, far from the watchful eyes of its creators. Just knowing that the Navia is out there, picking up passengers all by itself, makes 2015 (and our own driverless cars) seem just that little bit closer. To see the Navia in action, check out the video below.